Well, you probably know the myth and why the sea is actually called Aegean. Now the cape features ruins of the Temple of Poseidon, another father of Theseus (yes, he had two fathers! ), so it is a popular tourist spot, especially during sunset. And if you want to combine sightseeing with beach fun, you should stop over at Legrena. There are several beaches of different size, with different ground, open and secluded. Closer to the bus stop (Athens-Sounio bus) lies a long sandy beach. 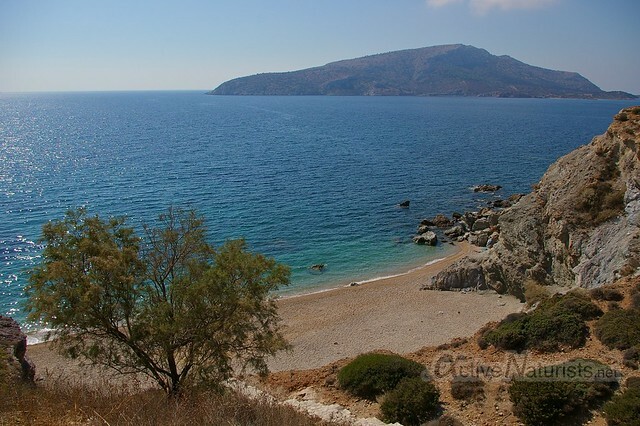 When we were there in August, it was almost empty, maybe because Athenians left to the islands and tourists do not know about it… It was easy to find a spot with no one else in the nearest 30 meters, but unfortunately it was not easy to find a spot to enter the sea for swimming. Well, it was fine for wading but too shallow for swimming. But further offshore the bottom is full of urchins, so it’s quite risky to walk. On another day, we were at a smaller sandy beach farther from the station but without urchins at the sea bottom. As we were alone there, we felt free to stay clothes-free. We played beach bats and ring frisbee, which turned out to be a blast, as it is more resistant to the wind blow than a regular disc frisbee and is also super-fast. Too bad I don’t have a video of that. Later there appeared one more naked man at the end of the beach, one clothed family, and one man kept walking forth and back. He pointed at us and said (in Greek) we were crazy to play around naked, although to be honest he himself seemed rather crazy, and why did he return several times if he didn’t like the site of us playing frisbee naked? 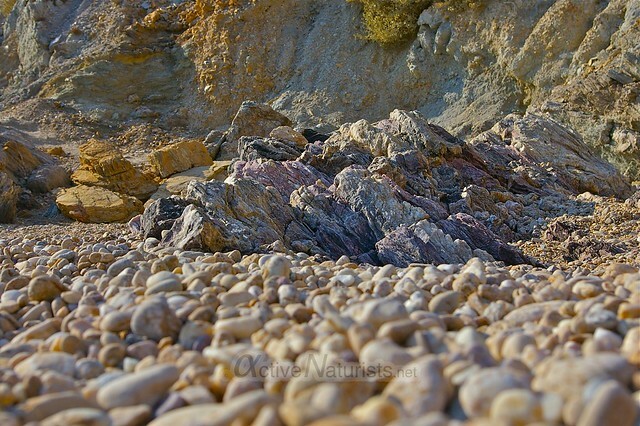 On another occasion in mid-October, on a very hot day, I visited the “official” nudist beach of Legrena. and some of the rocks are light-pink! I couldn’t sit anymore and went swimming. I saw several more coves with one or few naked men in each. 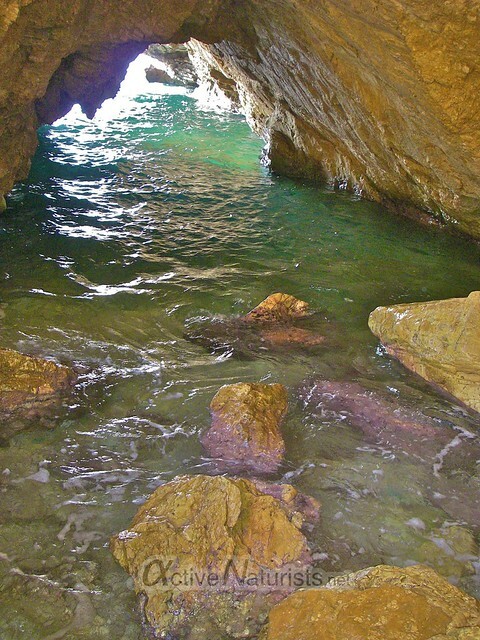 At one of the coves there was a partly submerged tunnel with some bright pinkish rocks. Later I walked to the “official” nudist part of the beach. This time the pathway was full beautiful light-green rocks. 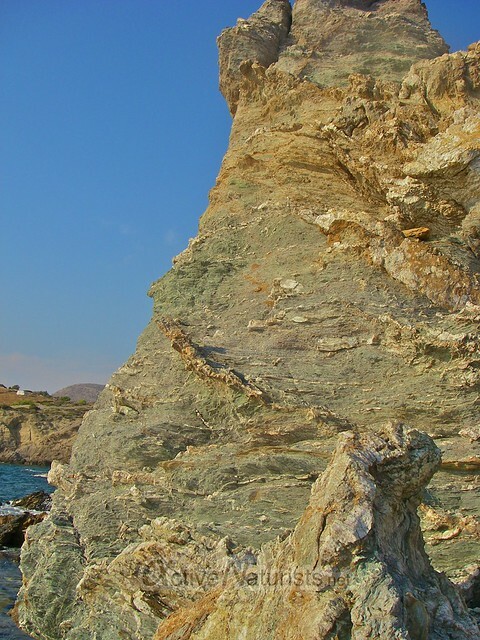 The entrance to the naturist part is announced by a notification (in Greek) on a huge rock. Another announcement is placed in the middle of the beach. And if you still don’t get the point or cannot read greek, there are some smaller international notifications, like this rock with an “FKK” sign. 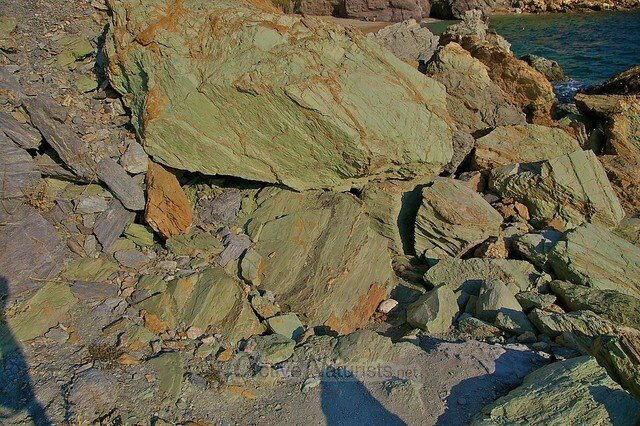 Again, there were some rocks of peculiar shapes and colors, like this dark-green ‘mini-vulcano’. This place must be certainly interesting for a geologist, I bet there are some naturists among them as well. i have been to this beach 3 times!! it is perfect and the water is very clear!! i slept in the cave which i found when i swam 2 minutes on the right! !